> McAfee > 8 next generation firewall features that significantly impact your network security team. Resource optimization involves the automation and streamlining of operational processes and management workflows so your IT team members can be freed up to focus their time, skills, and expertise on priority projects. 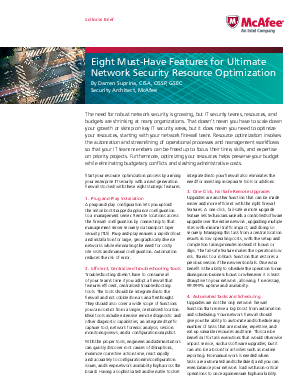 Start your resource optimization process by arming your enterprise IT security with a next-generation firewall stocked with these eight strategic features.